Old fashioned maple baked beans made from dried beans in the pressure cooker. These delicious baked beans are a staple for summer gatherings. If using soaked beans, soak beans overnight in cold water. 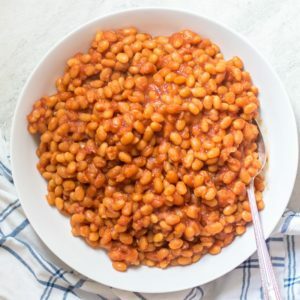 Drain beans and then add to inner pot of instant pot. Add in remaining ingredients, mix together and place lid on instant pot. Set on high pressure for 40 minutes if beans were soaked, 70 minutes if beans were not soaked. Let pressure release naturally and then serve. If your tomato juice is not low-sodium, decrease the seasoned salt from 2 teaspoons to 1 teaspoon. You can soak your beans overnight if you like, the beans will be softer and similar texture to if you are using canned beans. If you don't have maple syrup, you can instead use brown sugar or honey. If your family is opposed to chopped onions, omit the onions and add in 2 teaspoons dried onion powder. If you use water in place of the apple juice, you will need to double or triple your maple syrup or sweetener of choice. It is really important to let your instant pot release pressure naturally when cooking beans.